What is the MIND Coalition? Mental health affects all areas of our lives. We believe maintaining good mental health involves both effectively treating those who suffer from mental illness, and preventing mental illness in those who are susceptible to developing psychiatric disorders. Because prevention and treatment of mental illnesses requires an extremely broad spectrum of care and resources, no single organization encompasses all aspects of mental health. Additionally, because there are so many organizations working in specific areas of mental health, it is often difficult to know which resources will meet your specific needs. In order to more effectively raise awareness of mental health and make resources available to those in need, we have created the MIND Coalition. 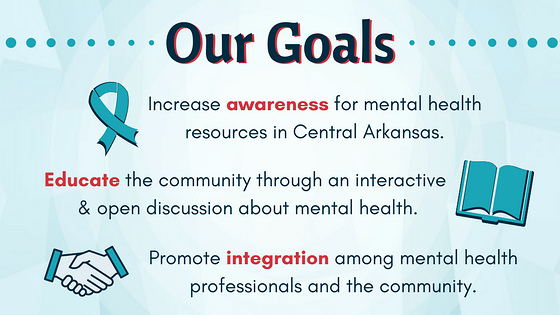 The MIND Coalition is working to integrate local organizations across all areas of mental health to better serve people in the Arkansas community. In doing so we hope to help individuals suffering from mental illness get access to the specific care they need, while educating the community on how to promote and maintain better mental health.